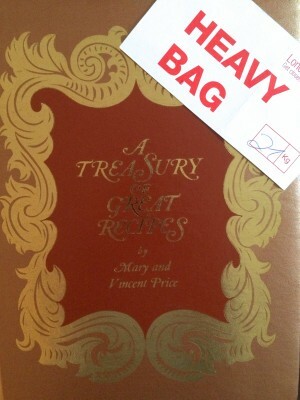 This latest cookalong was to celebrate the 50th anniversary of the magnificent Treasury of Great Recipes by Vincent and Mary Price. 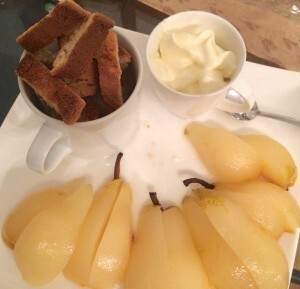 Oh yes, he was much more than just the Master of Menace… He was a true bon viveur and lover of food & entertaining. The Treasury is a collection of recipes he persuaded great chefs around the world to part with, plus a few of his own creations. As you might have guessed, this event was by Jenny of Silver Screen Suppers, who invited lots of people to join in and cook some delights from the Treasury. In keeping with Vincent’s love of entertaining, we invited our Antibes friends Mathew and Veronique to join us in our holiday home with Mr B’s sister and family. 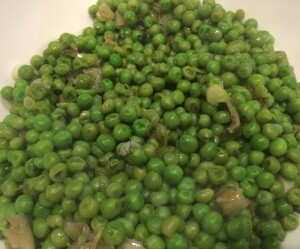 As I wasI decide to keep it reasonably simple, so a Caesar salad to start, followed by Sea Bream Biscay style, served with petits pois à la Française (from Hotel de la Poste in Beaune). I also made some crushed potatoes (my very own recipe, with gorgeous French spuds). 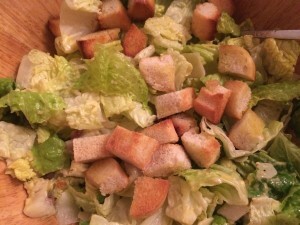 There was nothing ground-breaking about the Caesar salad (a Harrods Food Hall recipe, which turns out to be an interesting coincidence, but more of that in another post) – but it was delicious. Maybe something to do with the lovely fresh, crunchy lettuce and proper French mayonnaise. The sea bream recipe (from Sobrino de Botìn in Madrid) was excellent and pretty simple. 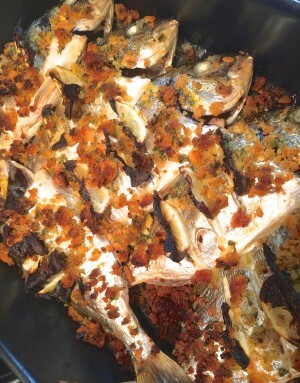 It’s baked on a bed of lemon, garlic, parsley and breadcrumbs, olive oil with more of the same on top. I’ve just spotted that I omitted to “baste the fish several times while it was baking”. Oops. That wasn’t a disaster and the dish was went down very well with the assembled company. I was quite relieved when Veronique said, discreetly, that she has a bit of a thing about fish with their heads still on. I’m also slightly squeamish about having the eyes winking up at me from my plate. Anyway, the upshot was that Mathew, ever the gentleman, filleted the fish for all the ladies. Vincent would have been proud of him! We let the children leave the table early so they could, in the spirit of the occasion, enjoy Vincent’s great film House on Haunted Hill – it promises “Terror Beyond Your Imagination”, but to be totally honest, to 21st century teens it’s more of a cause for hysterical laughter – they spotted dodgy sets and apparently some continuity errors. But they did have the good grace to compliment Vincent on his marvellous performance. All in all it was a wonderful evening – so lovely to be with friends and family in the south of France, enjoying great food and a plentiful supply of fine wines from Carrefour. I hope Vincent would be happy with my menu and the general conviviality of the evening. I think he might want a word with the teens though.